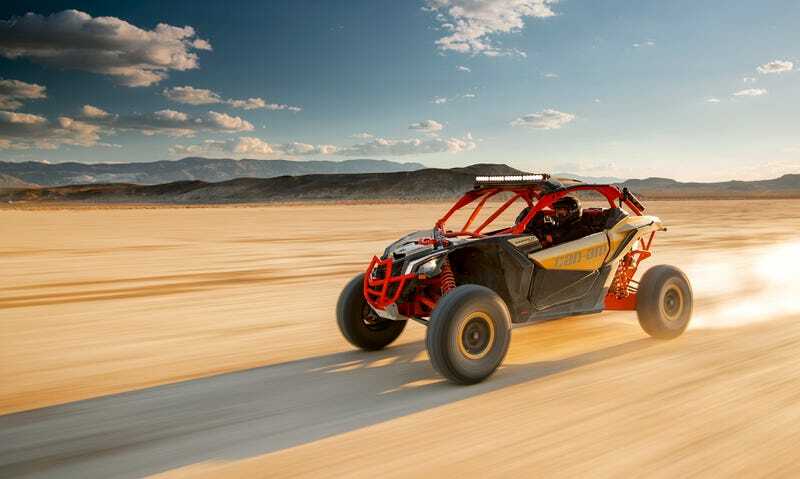 The Can-Am Maverick X3 looks like it could be dropped on the surface of Mars and start racing without skipping a beat. It’s somehow simultaneously sleek and rugged, it’s headed for mass production, and I’m ready for communion at the church of UTVs. Update: top speed estimated at 85mph and the selling price is about $23,000 to $26,000. Dune buggies are in the middle of a major revival right now, by another name: “UTVs.” Or “Side-By-Side ATVs.” Or just “SxS.” And they don’t actually have much in common with the VW-powered desert car you wish you had in high school. For the sake of clarity let’s break down the basic (generally accepted) nomenclature right now: a “dune buggy” is a really an old VW bug with a different body, possibly altered chassis and maybe some big tires. You would be more likely to see one on the beach than in the desert. A Baja Bug is somewhat similar, but with a lift kit instead of a body swap. Those tube-frame off-roaders you’ve seen with rear engines, often VW-sourced, and paddle tires are called “sand rails.” People go absolutely nuts with those and give them entirely too much horsepower. UTVs are sort of like miniature trucks with rear-mounted engines, sometimes designated for utility and sometimes purely built around recreation. They feature parallel or “side-by-side (SxS)” seating. And while you could sort of get away with calling any of these things “an ATV,” that term is generally reserved for what is also called a “quad;” pretty much a dirt bike with four wheels. The 2017 Can-Am Maverick X3 is side-by-side. We’ll just call it a UTV for simplicity. It’s also a 1.85 inch fully-welded tubular steel frame wrapped around a pair of adjustable racing seats and a 900cc turbocharged inline three-cylinder Rotax ACE engine rated to 154 horsepower at 7,500 RPM and 113 lb-ft of torque at 7,000. That gives it a slight edge on output over the Polaris RZR Turbo, which is pretty much the top of the food chain in this segment right now. Can-Am claims the Maverick X3 has enough juice to take the machine from stopped to 60 MPH in 4.9 seconds. The gearbox is a “high performance” CVT called QRS-X, and it is connected to 4WD. But the stuff below the steel is actually a lot more interesting than the engine. The highest-spec Maverick, the X rs, has 24 inches of rear suspension travel and 22 up front. The other variants get 20 inches all around. All that bump-absorption is maintained with balance and poise thanks to the rear trailing arm and three link configuration which basically helps keep the wheel in line when it’s getting womped all over the place. Up front the wheels are kept in place by arched double tubular A-Arms reinforced with a sway bar. If any of that sounds familiar, you might have also read the spec sheet on a trophy truck- the fastest racing class in Baja. It’s the same geometric concept, and the idea is to maximize control at speed under duress. Can-Am claims a 44/56 weight balance. The Maverick’s other big sell is its stance– the two-seat UTV has a 102 inch wheelbase, which Can-Am says is a full foot longer than the two-seat Polaris RZR Turbo. Length can be a little annoying in an off-road application but with optional 30 inch(!) tires and 15 inches of ground clearance this thing shouldn’t have any issues getting high-centered. Isn’t this just a junior varsity Ariel Nomad? Sort of looks like that, doesn’t it? The Nomad has the advantage of being street legal (I think?) and arguably being a little more elegant, but the Maverick has more ground clearance (up to 15 inches versus Nomad’s 11-and-change”) and of course 4WD. The Nomad might be faster, but even before prices come out I’m extremely confident that the Maverick will be significantly less expensive than the $75,000-MSRP Ariel. Besides, you can buy a Can-Am at plenty of powersports shops in the U.S.A. Where’s your local Ariel dealer? But it’s still probably around $25,000, shouldn’t I buy a Jeep Wrangler instead? If your objective is to enjoy open-air driving to the beach and ice cream stand, absolutely. But UTVs in general are getting so popular now because people are realizing you get a lot of capability for your money, even at the price of a new Jeep. 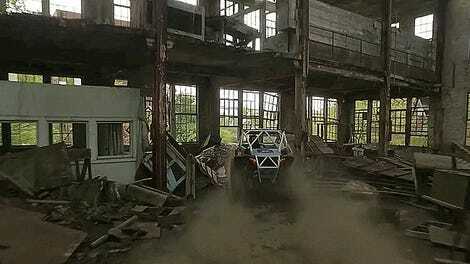 A $25,000 UTV smiles and skips over obstacles that you’d spend hours on in some $50,000 Jeeps. And once your Jeep is heavily modified enough to rip like a UTV, it’s a miserable daily driving and long-haul experience so you’re looking at tow-trucks and trailers anyway. I’m not spending $25,000 on a toy to bash up either way. Right there with ya, friend. That’s why we have to rummage through Craigslist. Doesn’t stop me from wanting one of these sand-throwing beauties. I’ve respected the idea of the UTV for years and I totally get the appeal. But the Maverick X3 is the first one I actually want a poster of. And for me, that changes everything. If you’re as fired up about the look of this thing as I am you can flip through a few more videos Can-Am has uploaded in addition to the “in-depth” clip I posted above.